Here’s the first chapter of The Woman Upstairs, read by the author, Claire Messud. As I never listen to audio books, I find it fascinating to hear an excerpt from a novel read out loud by the very person who has written this piece, who lets us see how it’s supposed to sound and feel. Or at least we know how the words felt and sounded for their creator during the writing process, and what she was trying to say. 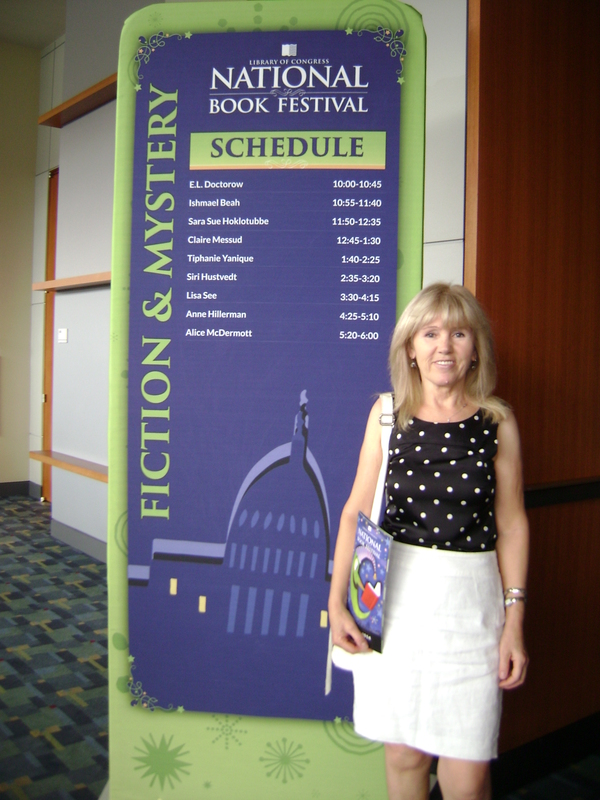 Yesterday, the 14th Library of Congress National Book Festival was a blast! This year, it was moved from its traditional spot on the National Mall to the Washington Convention Center, a huge three-story building with plenty of room for all kinds of programs, and proved to be a perfect venue for such an extraordinary event. You could see hundreds (literally hundreds!) of book lovers of all ages strolling around the hallways, carrying big green bags filled with free brochures and posters, and the books they purchased. The rooms where authors, poets, and illustrators spoke about their work were filled with captivated audiences. 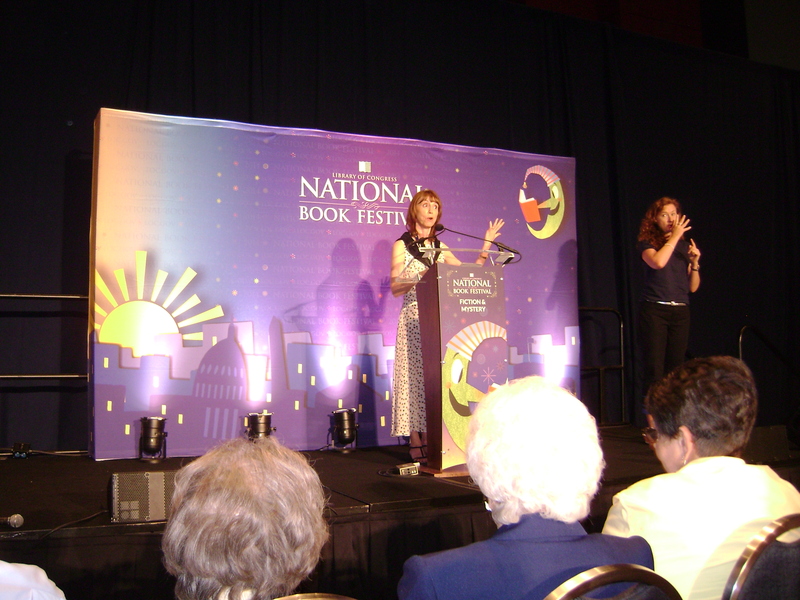 I was lucky to listen to several writers, but I was especially impressed by Claire Messud, Siri Hustvedt, and Lisa See. All three are incredible writers and speakers. 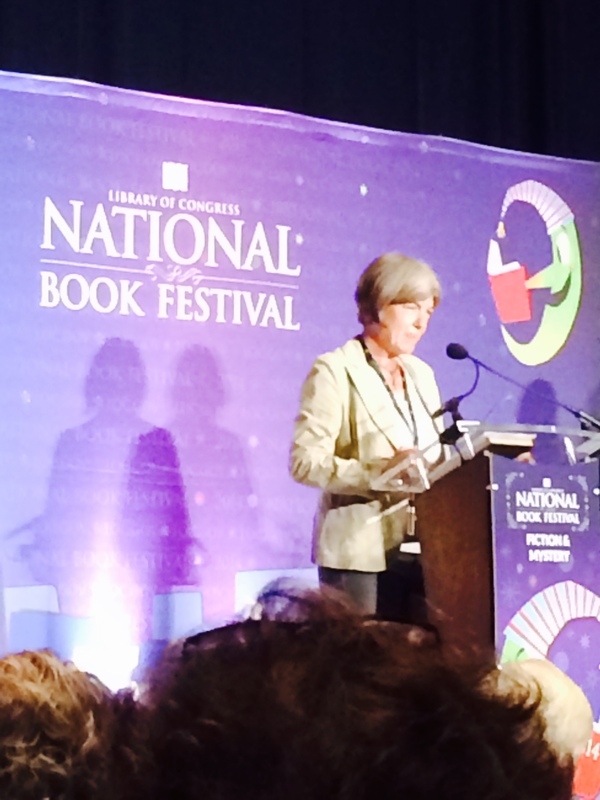 Claire Messud said that some books she’d read in high school had a fireworks effect on her. Clearly, that’s what she’s been striving in her own writing—to affect her readers the same way. And that’s exactly how I felt while listening to the opening of her latest novel, The Woman Upstairs, that she read to us. It sounded like a powerful free verse and yes, it sounded like fireworks! The opening of this novel is a tirade of a 42-year-old elementary school teacher, a closet artist, who rants about her joyless, unappreciated, unsatisfying life, and she captivates your attention right away. But I’m not going to dwell on what the author said about this woman, because I’ll post my opinion of the book as soon as I read it (soon!). Yes, I bought it and had it autographed—yay! J I’ll just say that Claire Messud loves ranters—disagreeable people, eccentric people, people with problems. She wants them to be heard, so she gives them a voice. The Woman Upstairs is about someone who wants to be an artist and about someone who is an artist. In Claire Messud’s view, everybody is an artist, in a way, because every one of us has a creative artistic side—whether it’s cooking or building something or writing. But, unfortunately, “so much of our life never breaks the surface,” and that’s what she likes to explore in her novels—“the interior life” of a person. Intriguing? Yes! Her advice to aspiring writers: 1. No one can write well without reading. So read, read, read! 2. When you’re stuck, read a great piece by another author, and then do “automatic writing”—immediately! That’s how she overcame her writing block. 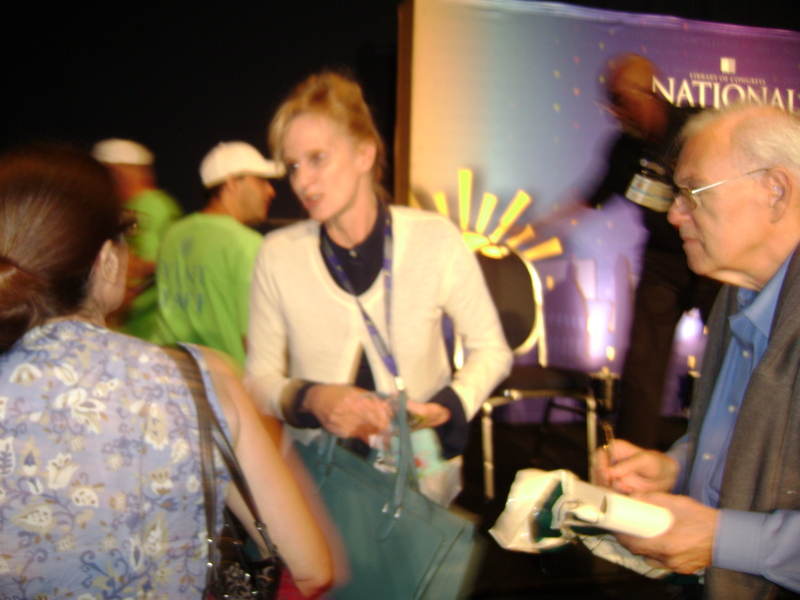 After her first poem had been published in a magazine (1980’s), she wasn’t able to write anymore because she scrutinized every line she wrote, comparing it to “great literature.” Luckily, she took David Shapiro’s advice about “automatic writing” and she knocked off 30 pages at one setting! Lisa See, whose two novels I reviewed in this blog, spoke about a person’s identity, the reason she writes about China, and her latest novel China Dolls. “How do we identify ourselves?” Lisa See asks, and answers, “We identify ourselves by the people around us.” She has 400 relatives, many of them Chinese, many American, or mixed. So no wonder she’s influenced by her heritage. “Art is the heartbeat of an artist.” And that’s what her writing and her books mean for her—they are her heartbeat. Is it easy for her to write a book? No. Sometimes she spends long months in a “dark place,” trying to make it right. So it is hard. But she hopes that she’s improving with every book. Her advice to aspiring writers: Writing is not a “one-night-stand” but “a long marriage.” There are too many distractions in your life that can prevent you from writing. So be passionate about it! Live in the clothes of your characters. Care. Write 4,000 words a day—every day! Or at least 500 words, but do not stop! Well, what a better advice can you get? I was absolutely thrilled by the festival. And I must say, it’s one of the greatest sources of inspiration for me. 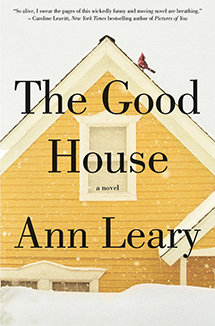 In this interview, Ann Leary, the author of The Good House, talks about her passion for reading and her daily writing routine. She tells us how her characters “hijack” her books, taking over the narration, once she gets deep into a plot… I love that! Ann Leary is not only a talented writer, but she’s a sharp, funny, and down-to-earth woman, and beautiful to boot. The world is saddened by the untimely demise of Robin Williams, a beloved actor and comedian. I was surprised to learn that he’d been struggling with alcohol addiction. Surprised, because, in my opinion, the man had everything—talent, fame, success, family, money. Then again, alcohol addiction can diminish, and even negate, the value of all that, right? This tragedy reminded me of Ann Leary’s The Good House that I’ve just read, that explores this very issue—alcoholism. It portrays a 60-year-old woman, pretty successful too, although not a celebrity, who has been struggling with the addiction for decades, but managed to conceal it—also quite successfully—from everybody else, except her children. Hildy Good lives in a great house and has a good income. But she’s divorced and she drowns her loneliness in wine. She is bitter at her two daughters who confronted her drinking and forced her to check into a rehab. Having completed the program, she continues drinking–secretly. Hildy’s biggest problem is denial of having a problem. A glass or two in the evening? What’s wrong with that? (Isn’t it what all alcoholics say?) The trouble is that she goes down to her little niche in the basement, every night, not for a glass or too, but for a bottle or two. Wine makes her feel content, more or less, and when she befriends a new neighbor, Rebecca, in whom she can finally confide, she doesn’t feel too lonely anymore. Their friendship is not necessarily an ideal one (it has certain strings attached), but it works for a while. Hildy is well-informed about people in town, because in order to be successful in her field, she “makes it her business to know everybody’s business.” Her very first lines, in fact, show us that she knows what she’s talking about. She starts her narrative with this claim: “I can walk through a house once and know more about its occupants than a psychiatrist could after a year of session. … General wear and tear is a healthy sign; a house that’s too antiseptic speaks as much to me of domestic discord as a house in complete disarray.” (1) And it’s true, as we find out later in the novel. But just how true her bragging that she’s “the top real estate agent in town” is, we find out later, too. After all, we believe everything she says in the beginning, before we learn that she’s quite unreliable as a narrator. The Good House is both sad and educational, showing how hard the struggle with addiction is. But it’s funny too, thanks to Hildy the narrator with a great sense of humor. I love the way she reveals her own little secrets, as well as interesting details from other people’s lives, piecemeal. She lets slip something new in every chapter, and that surely makes us crave for more information, so we keep turning pages. Ann Leary is a talented writer. I’m glad I’ve “discovered” her, and I highly recommend her work. 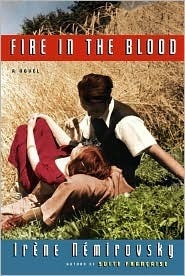 Irene Nemirovsky’s Fire in the Blood is a poignant love story, set in a small town in France, in the late 1930s. It is a short novel (a novella, really), but it’s very rich in description, characterization, intensity, and themes. The central theme, however, raised by Nemirovsky, is this: Old age and youth are at odds with one another. Passion and love, loss and regret. The impossibility of turning the clock back and returning to the days of happiness. A woman’s true self. These questions are raised and pondered by a middle-aged man named Silvio, the narrator of the novel. After roaming the world, Silvio finally returns home and resides in a secluded place close to a small town. He’s had an eventful life, and now all he wants to do is sit in a bar or at home in front of the fireplace, drink wine, and reminisce about the good old days. But he gets caught up in the middle of the events happening to a family he cares about, and that’s what makes him ask the proverbial questions about women, who they are and what they want. “Who knows the real woman?” he asks himself. “The lover or the husband? Are they really so different? Or are they subtly interwoven and inseparable? … It all comes down to the same thing: neither [of them does],” he concludes, sadly. Well, Silvio may ask these questions about women, but he might as well ask the same questions about himself. He doesn’t understand how he happened to have become what he is now, so different from what he used to be at twenty. The ending of Fire in the Blood is quite abrupt, but it doesn’t diminish the novel’s value. It does have a quite surprising twist, too. Irene Nemirovsky was a fine writer, whose life was tragically cut short by the Nazis in 1942.